We try to make our site interesting to our clients, visitors, and judges of wooden homes. 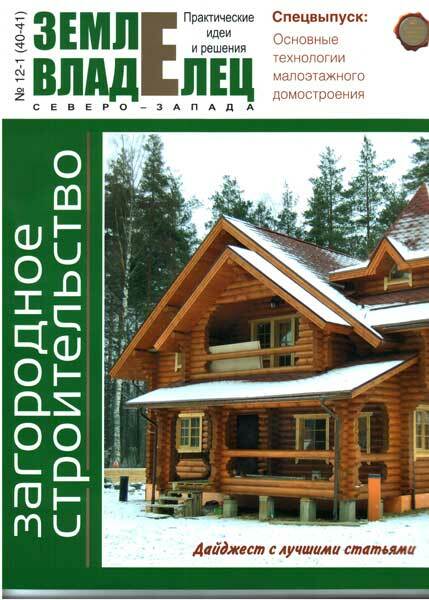 Therefore on our site it is placed more than 70 articles devoted to handcrafted wooden houses, to other themes accompanying building and the maintenance of a country house. The full list of articles is (in Russian) resulted here. Unfortunately, it is inconvenient to translate all these materials into English. 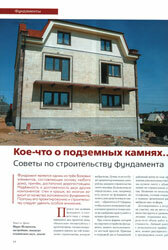 Nevertheless, we wish to stop short on the publications written in the co-authorship with experts of our company. We love and appreciate wooden houses for their beauty, ecological compatibility, cleanliness and freshness of air in them. And we would like, that the number of adherents of wooden houses and a healthy way of life only increased. On the other hand, we would like that these people knew about the latest achievements in technologies of building of houses as houses brought to people only pleasure and positive emotions. 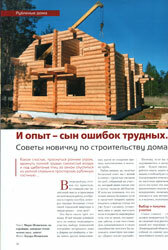 For this purpose we try to popularize the information about modern houses, approaches to their building and, together with a number of authors, have prepared a cycle of articles on all spectrum of questions of building of the wooden house: from a choice of the ground area and a base, till building of a roof and installation of engineering networks. We also invite you to familiarize with theses of these materials. 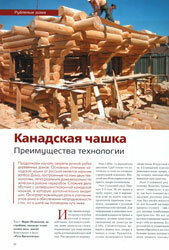 The part of resulted below materials is in detail stated in English in section "Secrets of technologies of wooden house building". "And experience - the son of difficult errors. 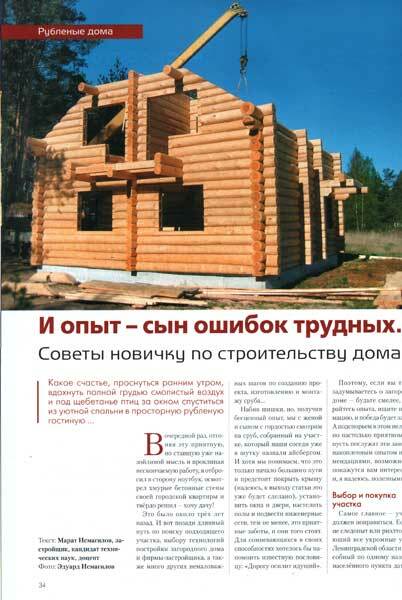 Advices to the beginner about building of the wooden house"
This and some other articles are written by one of our clients who, having interested in technical details of building of the wooden house, has written a cycle of articles describing all stages of building of the country residence. In first article he dwelled on questions of a choice of the ground area and formation of view of the future house, including creation of its project. Completely (in Russian) you can read this article on our site here, or on a site of publishing house of magazine - here. 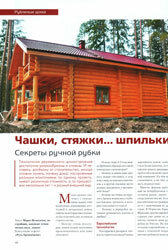 For increase of the image of article (drawing at the left) it is necessary to click on it with a mouse. 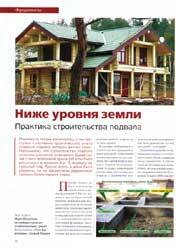 "Everyone chooses for himself... Technology and the building company"
In this article author shares experience of choice of technology of building of the house. 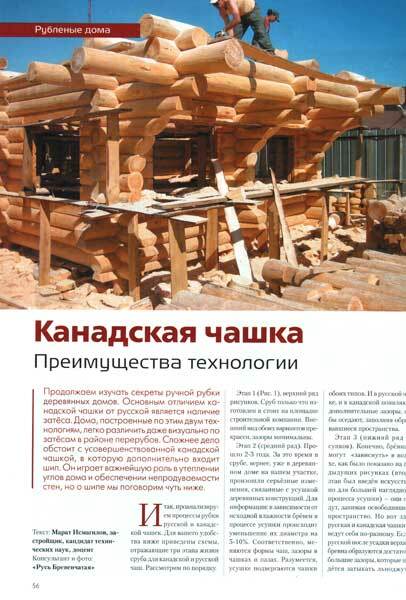 Author had carried out the detailed analysis of existing technologies of building of country houses: frame housing construction, a fixed timbering, houses made of a bar and milled round logs. 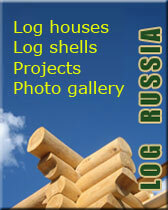 Having weighed all pro's and con's author has stopped on the handcrafted wooden house. The second question considered in article: how to choose the building company, on what moments it is necessary to pay attention. 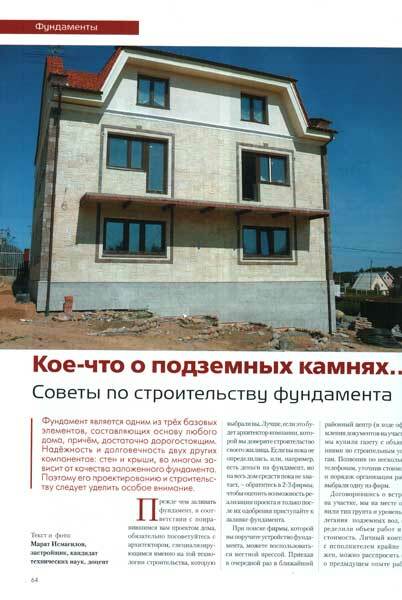 Leaning on the personal experience (before ordering the project and the house in our company, he has received a negative operational experience with several russian building companies) author gives valuable advice and describes criteria of a choice of the building company which can be entrusted to construct the house. 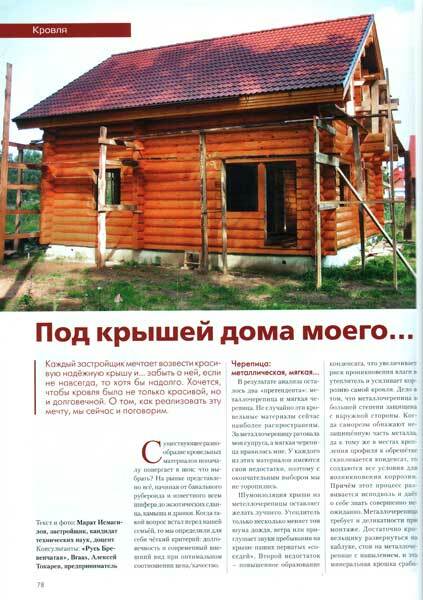 Completely (in Russian) you can read this article on our site here, or on a site of publishing house of magazine. "Notches, buckles... studs. 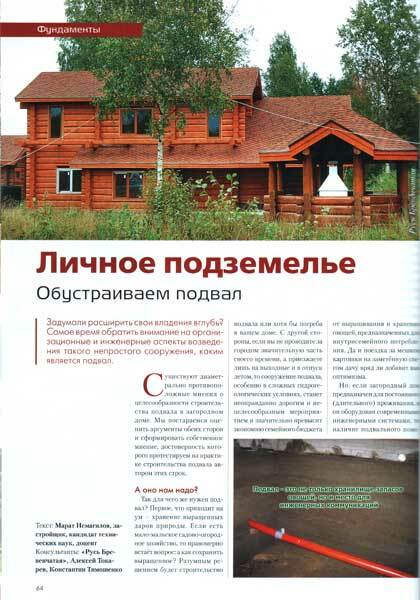 Secrets of handcrafted log house building"
Material of this and following article are devoted to the detailed description of modern technologies of handcrafted log house building. 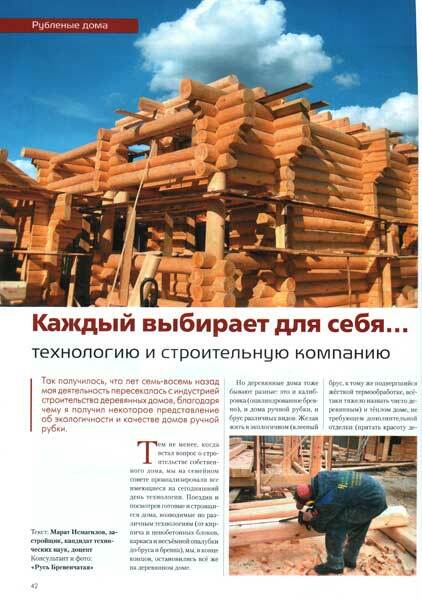 They have formed a basis for section "Secrets of technologies of handcrafted log house building" with which you can already familiarize in English, having passed on this reference. 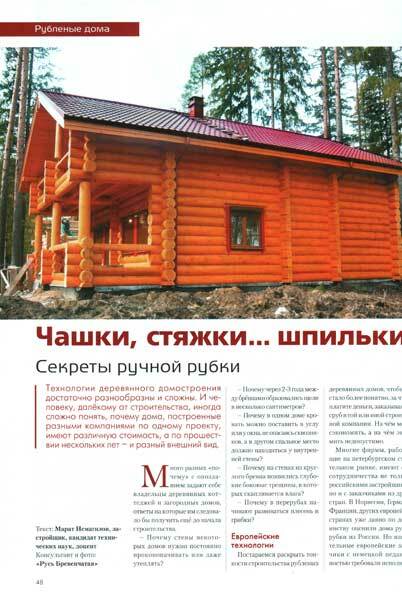 In first article it is told about European technologies applied by us such as "curtaining of external corners of a log shell", application of metal couplers for face connection of logs, about obligatory drawing of antiseptics on the latent surfaces of house, about features of application of a semioval log. "The Canadian notch - advantages of technology"
It is the second article describing technologies applied by us (see previous article). Here author in details dwells on the description of advantages of the Canadian notch (i.e. 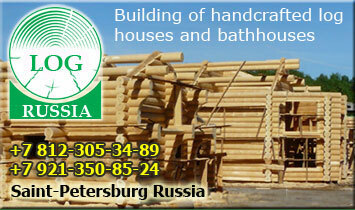 with application of a dowel) in comparison with a simple round notch traditional for Russia. Here you can find information about: Necessity of application of a special gap on an axis of logs - "undercut" is also described, technological saw cut for pressure removal in a log and managements of formation of cracks, special notches for making of window and door apertures etc. "Under a roof of my house..."
Author analyzes existing kinds of a roofing material, considers advantages and lacks of a metal, flexible tile and stops his choice on the natural cement-sand tile. Advantages of application of a natural tile in the wooden house are described. 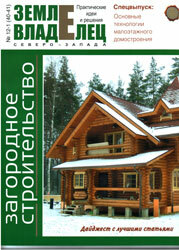 The design of roofing "pie", appointment of rafters, a ridged log and other elements of a roof are in details considered. Advice about correct application of a waterproofing and vapour seal of under roofing spaces is given. "Something about reefs. 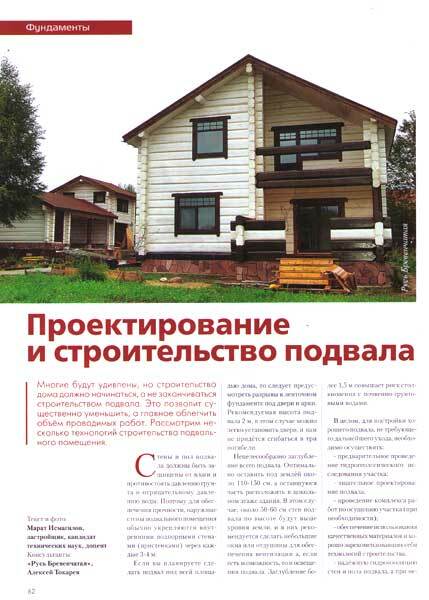 Advice about base building"
Author stops on existing approaches to building of the base for the country house, and then in detail considers building of the band-columnar base of the house. "A personal vault: cellar building"
It is a cycle from 3 articles in which existing methods of building of a cellar in a country house are in details considered. 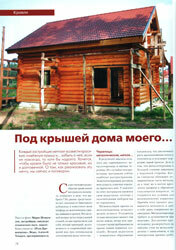 Passing from the theory to practice, personal practical experience of making of a cellar in the wooden house is shown. 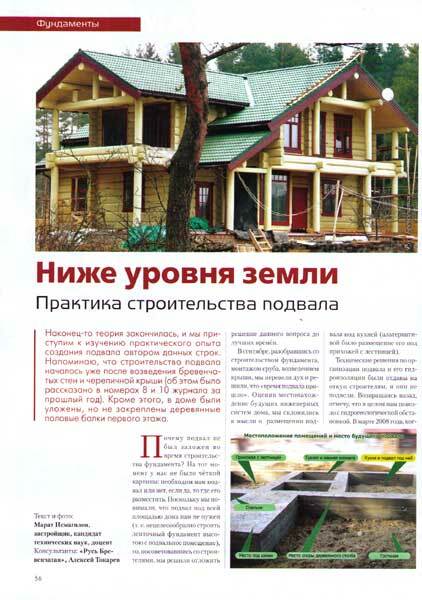 Completely (in Russian) you can read this article on our site here: 1, 2, 3 .